Tsuji Shinnosuke (nicknamed "Shaggy Hair" by Kenichi) first appears in Battle 24 as an ambitious rival of Kisara's, often getting into arguments with other members about who was stronger. 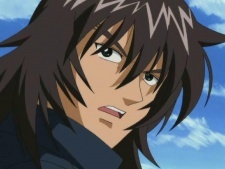 Though he has few techniques, his fighting experience without any particular fighting style more than made up for it during his first fight with Kenichi. Tsuji had hoped to one day lead a gang stronger than Ragnarok but his dreams were crushed by Kenichi. He initially had hordes of men as followers, but after he was beaten by Kenichi's unintentional sneak attack, he lost all but two of them. Tsuji was angry at Kenichi at first, but calmed down when his two remaining followers stated that they stuck by him because he was their friend. He grows a bit of respect for Kenichi, informing him of Takeda's impending punishment at the hands of Ragnarok and warning him of Hermit. Following his defeat by Kenichi, Tsuji goes into the mountains to train. He finds a master, a large old man wearing a bear skin over his head that stretched down to his legs who decided to teach Tsuji his martial arts under the condition that Tsuji has to leave the mountains when he finishes his training. Tsuji comes back from his training in the mountains to return to Ragnarok, and immediately heads over to Kisara's headquarters to challenge her. However, he is more than surprised to find out that Ragnarok has disbanded and Shinpaku Alliance now holds it. Losing the initial purpose of his training, he decides to seek out Kenichi again to defeat him in a rematch. While he fights Kenichi in Ryozanpaku, Tsuji demonstrates a tremendous increase in skill, though his punches are still slow enough for Kenichi to dodge. Nonetheless, he was able to obtain a victory over Kenichi, ironically by means of an opportune attack when Kenichi looked away, similar to how he was defeated by Kenichi. He then runs away refusing a rematch saying that he's going to hold onto the victory for the rest of his life and never fight Kenichi again. According to Akisame, the style Tsuji uses is possibly over a thousand years old and is one of the oldest Japanese styles of Koppou and revolved around the Kanji 昒, which means talent or skill to understand a clever technique in little time in contemporary Japanese and "core" in ancient Japanese. For practitioners, the difference between those who knew the "core" and those who didn't was in their understanding. Tsuji's way of Koppou was a little different from how it is used in regular styles.